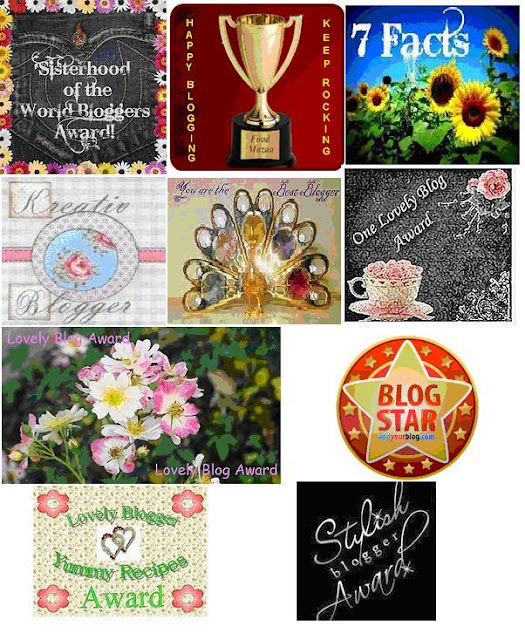 Before I start another week of blogging and posting, I would like to take time and say my heart felt thanks to my lovely and sweet fellow bloggers who have taken their time to remember me and share these wonderful awards with me. Once again I would like to thank Chitra, Ambreen, Prathima Shivraj, Vardhini, Aarthi and Raksha for sharing their awards with me. So sweet and kind of them. I had been postponing this post for some time and feel so bad for not acknowledging this earlier it self. But I guess now is better than never at all. It feels nice to be remembered and acknowledged as it gives a meaning and purpose for your effort. A BIG THANK YOU AND HUGS FROM ME. Wow, truck loads of awards!!!! !Congratulations on the same and wish u many more in future. Congrats Radhika!!! Loads of awards indeed..
Congrats on the awards galore… Keep going!!! Congrats Radhika, u rock gal..
Congrats for your well deserved awards dear..
Congrats on ur awards sweety.. U deserve them dear ! Congrats on ur well deserved awards! !